First Line: Sitting at the bedroom window, Emma looks out at the night-time square. It's been ten long years since Jeanie Long has been locked up for the murder of teenager Abigail Mantel. Ten long years, and now evidence has come forward that proves Jeanie's innocence. The villagers of Elvet on the East Yorkshire coast know this means Abigail's killer is still at large. Yorkshire police believe it best to bring in an investigative team from outside to re-open the case, and Northumbria's Detective Inspector Vera Stanhope finds herself amongst the "Yorkies" sifting through all the witnesses' stories to piece together the truth. Stanhope finds many questions that need answers. Two of the leads on the original case left the force and are now living in the area. Both of them had seemed content with Jeanie Long's conviction. The murdered girl's father is a businessman and no better than he has to be. Even the victim's best friend seems wreathed in daydreams and unsure of what really went on ten years ago. Stanhope has her work cut out for her. But if there's anyone with the patience to get to the bottom of this case, it's Vera Stanhope. A middle-aged, homely woman, she's used to being in the background and allowed to listen and observe. When she finds the loose thread of a clue, she worries and worries at it until it's pulled loose, and she follows wherever it leads. She is quite simply a joy to watch as the case unfolds. 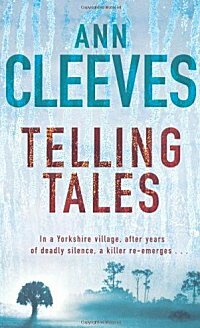 Ann Cleeves is one of the most talented crime fiction writers today. Her atmospheric settings bring in the natural world and tease the imagination as her plots twist and turn-- and her characterizations are brilliant, never hitting a false note. If you've never tried a book written by Ann Cleeves, I strongly urge you to do so! I'll add the first book in this series to my list-- I love the idea of a middle aged woman that solves crimes by fading into the background. Cathy - I'm so glad you liked this one :-). I like Ann Cleeves very much, and Vera Stanhope. It's so nice to hear you like them, too. Laura-- She doesn't always fade well, but she is a marvelous character! Margot-- I don't think I've yet to read a Cleeves novel that I didn't enjoy! Dorte-- I think the "Everyman" or "Everywoman" element is very strong for most readers. We aren't all beautiful slim, have perfect hair and blindingly white teeth, so I think it's good to read about someone on par with most of us who gets ahead quite well on brains instead of looks. Barbara-- I know exactly what you mean!